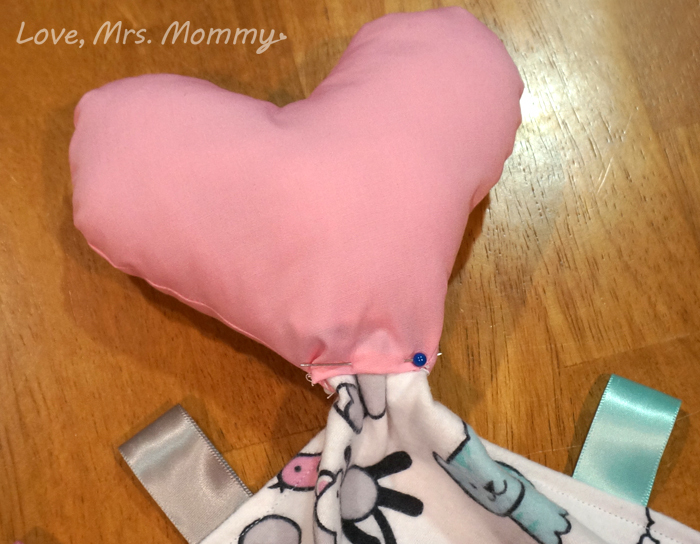 Love, Mrs. Mommy: DIY Lovey Blanket with Ribbons and Stuffed Heart! 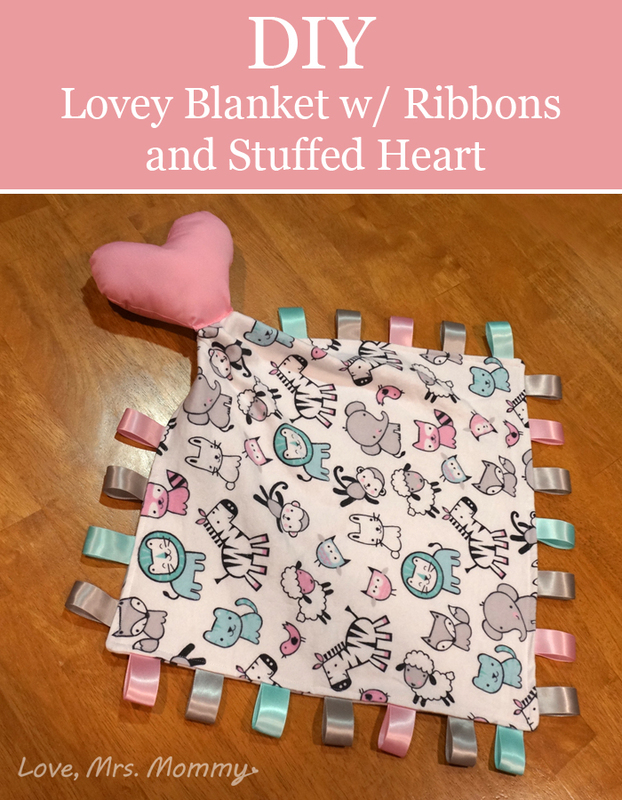 DIY Lovey Blanket with Ribbons and Stuffed Heart! My daughter enjoys holding and playing with her lovey blanket, so much so that I was thinking of getting her another one. But, after taking a close look at it, I thought to myself… I can totally make this! So I decided to give it a whirl! Not only would this be great to make for your little one, but this would make a wonderful baby shower gift for a friend or the baby’s first birthday present! 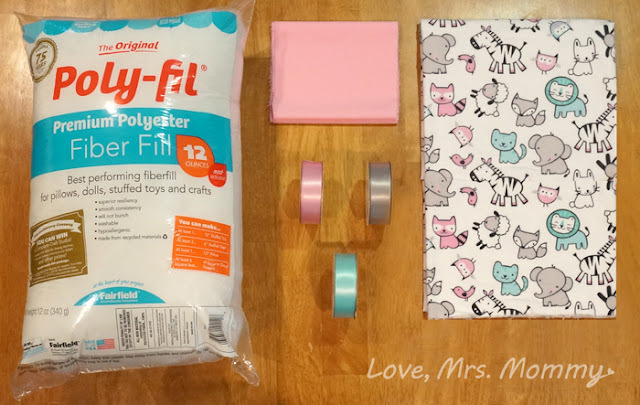 Here are my simple and easy DIY steps to making your very own Lovey Blanket! First you need to cut the fabric squares for the blanket. I cut mine 15.5” x 15.5”. I allowed for a 1/4” hem on either end. That way the finished product will be 15” x 15”. You can choose to make your blanket smaller or larger. It’s up to you! Next, cut your ribbon in 4” pieces. I needed 24 pieces of cut ribbon to go all the way around the blanket. You might need more or less depending on the width of the ribbon you choose. 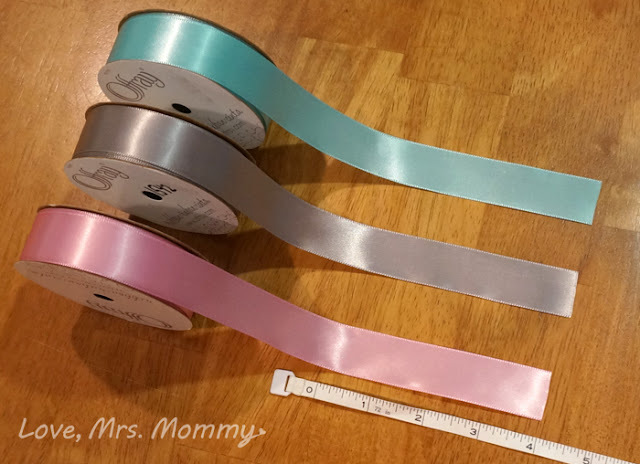 Once you have all your ribbon cut, fold each ribbon over so that the right side is facing up and pin it to the print side of your fabric so that the ribbon is pointing inward toward the center of your material. I spaced my ribbon out so that they were about an inch apart and left an inch at each corner free of any ribbon (note: this material will be turned inside out at the end). Also, don’t forget to leave room on two adjoining sides for the stuffed heart to be attached. I left about 4.5 inches on each end and didn’t place any ribbons in this area. Once all your ribbon is pinned in place, it’s time to start sewing! Give yourself a 1/4” hem all the way around the fabric. Next, I cut out a paper heart to the size I liked as a template. I made mine approximately 6.5” wide (at the top) and allowed for a 1/3” hem because it will need to be turned inside out for the stuffing to be placed inside. Then, cut two pieces of the fabric you chose for the heart and pin your template to it. When ready, cut your fabric along the template with your scissors. Then, turn the pieces of material so the right sides are touching and the backs are out and pin them in place. Remember, this is going to be turned inside out after you sew it together. Now it’s time to head back to the sewing machine. (Note: when working on different pieces of material at the sewing machine, be aware that you might need to change out the thread to a matching shade.) Give yourself about a 1/3” hem all the way around the heart, but leave the bottom open so that you can place the stuffing inside. Once sewed, turn the heart inside out and place the stuffing inside. Be sure to pack a bunch in as you want to fill it so that it’s nice and cushiony, like a little pillow. Now that your heart is made, (woo hoo!) it’s time to go back to the blanket. 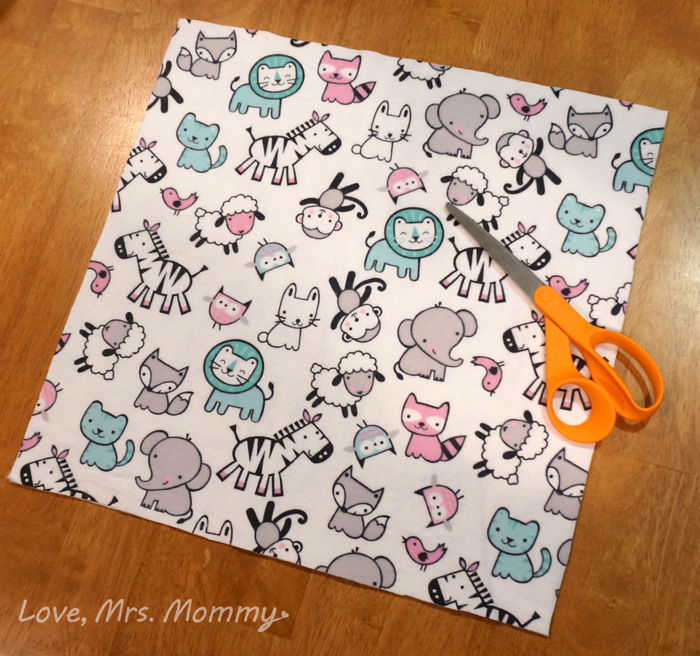 Place both pieces of your blanket material so that the print is touching and the backs are to the outside, just like you did with the heart fabric. Then, pin it in place. Be sure to leave the area where you didn’t place any ribbons free of pins. This is where you are going to turn the blanket inside out. Head back to your trusty sewing machine and sew 1/4” hem all the way around leaving that corner open. Once your material is sewed together turn the blanket inside out and voila! Your ribbon is sticking outside of the blanket and it looks soooo cute! Now that it’s turned inside out you will need to sew the corner together that you used to do that. Continue the same 1/4” hemline and sew over your opening. Now for the finishing touch… adding the heart! Taking the corner that you are using to attach the heart, fold the material neatly on the sides so that you can place it inside the bottom of the heart. Once you have it positioned in place, fold the bottom of the heart material under (on the front and backside) so that you can get a nice hemline and pin it in place. Lastly, sew the bottom part of the heart to the blanket (I went over it twice, just to make it a strong hem) and you are done! This is super cute!! Can't wait to make one. Thank you for sharing. I have actually made a taggie blanket before. My baby loved it. This is such a sweet blanket. I love how easy this is too! 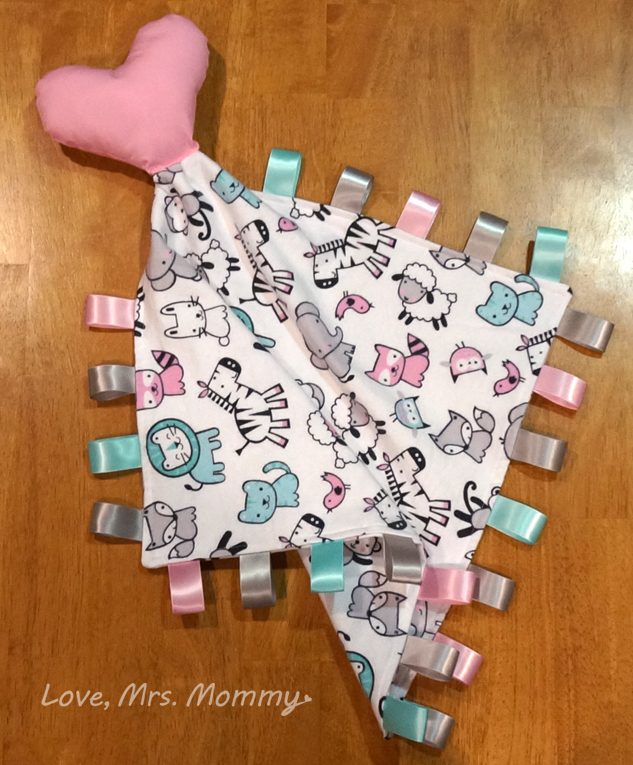 This is really a cute sensory blanket--I should be able to do this--thanks for sharing this idea. This is so cute. I love the pattern.